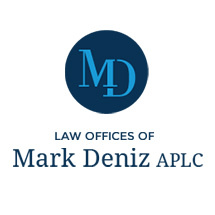 The Law Offices of Mark Deniz APLC is lead by former Prosecutor Mark Deniz and is dedicated to DUI and Criminal Defense. Our firm takes pride in working tirelessly with efficiency and discretion. At The Law Office of Mark Deniz APLC, we take an proactive approach when defending our clients against criminal charges. We start investigating your case from day one, seeking out useful opportunities and analyzing possible defense strategies. You can be assured that your lawyer has done everything necessary to place you in the best possible legal position. Attorney Mark Deniz has a great deal of experience working with criminal defense cases, experience that began in almost 10 years while working as a district attorney. During this time, Mr. Deniz learned a great deal about the tactics and procedures followed by California prosecutors. Today, he puts this knowledge to work for his clients, using the experience he gained while working for the other side to defend his clients' rights and interests. Our firm is ready to navigate our clients through the criminal process. This personal approach is reflected in Mr. Deniz's perfect 10.0 "Superb" AVVO rating, a ranking that can only be achieved through skilled representation and unwavering dedication to one's clients. Our law firm is conveniently located in the heart of Mission Valley, with complimentary parking available. We offer free initial consultations to all of our potential clients, as well as evening and weekend appointments upon request. We offer payment plans to our clients. Be Proactive and call now. I can't thank Mr. Deniz enough for his hard work on our case! He worked diligently to achieve a resolution I didn't think was possible. He was always available by phone and email and always willing to answer my questions. Hiring Mr. Deniz was the best decision I've ever made. Mark and Alicia took on a hard Federal DUI case and won. I can't recommended this team enough. Extremely thorough and they got the job done at a great price. Thanks!